I went back into the mouth of Ignorant America, and rather than ignore it which was one strategy I could have taken, I addressed some of the hated ignorance head on. I got 3 people who posted anti-Islamic hate speech to realize their closed-mindedness enough to engage in a healthy dialogue, thanking me for the new understanding and thanking each other for our time. Now 3 was not many, but it was indeed my own little breakthrough. Others called me a “liberal/progressive loon” and a “naive prick” who would be sorry when I was raped by a Muslim at knifepoint and the Muslims take over America. They should know I have already been sexually assaulted by a U.S. Naval officer. And my love for my country of the United States of America is founded in its ability to learn, change, grow, combine pride and humility, and embrace. Luckily, I have seen that America and have faith in it. Here’s the story of this week. Duke University Student Affairs Religious Life, under the umbrella of Duke University Chapel, supports 21 Christian groups of different denominations including Duke’s founding denomination Methodist, along with Catholic, Eastern Orthodox (with a different Christian calendar) and Lutheran as well as non-denominaton groups and Mormons, 1 Jewish student group, 1 Hindu group, 1 Buddhist Meditation association, and and 1 group for the 700 Muslim students on campus. and the ability to use the Chapel basement and facilities upon approved request. And worship via media outlets including live webcasts on Duke Chapel’s YouTube Channel and DukeStream, live TV broadcasts on Duke Campus IPTV Channel 1-3 and Duke Hospital Cable TV Channel 12, radio broadcasts on WDNC 620 AM LIVE and WPTF-AM 680, cable TV on Channel 18, Durham Community Media and Channel 8, The Peoples Channel. In addition, Sunday and Vespers Service Archives are available online. The Duke Faith Council, comprised of 10 scholars, fosters and models profound conversations across faith traditions in order to deepen participants’ practice of their own faiths, understanding of other faiths, and relationships across religious and cultural divides, and to facilitate such conversations within the University and beyond. The Faith Council sponsors a number of events throughout the year including interfaith panels and lectures. Past speakers have included award-winning author Stephen Prothero, Imam Feisal Rauf of the Cordoba Initiative. Panels have included “Living Faiths: What do religions have to learn from each other?”, and “Religious Responses to 9/11”. The Faith Council also coordinates Duke’s involvement in President Obama’s Interfaith and Community Service Campus Challenge. Duke’s Undergraduate Faith Council create opportunities for interfaith engagement among their peers. They plan community service events, dialogue dinners, text studies and public events that will draw participation from students in their own faith traditions and the wider Duke community. 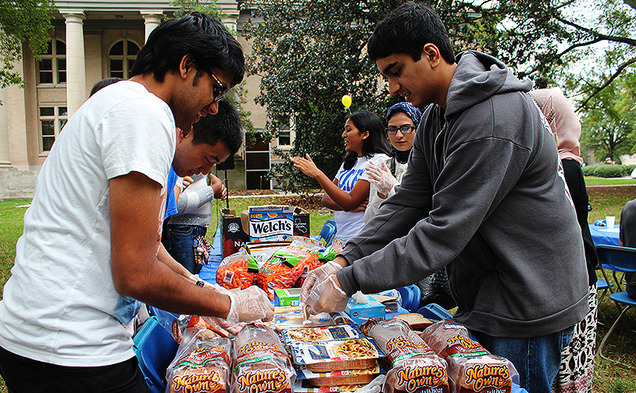 Duke’s interfaith engagement is strengthened by partnerships with a number of local and international interfaith organizations. When it comes to supporting students in strengthening their faiths and interreligious understandings, the university is doing well. This week it was announced that the Duke Muslim Student Association (with a small Center for Muslim Life and a staff of two) would do the 3-minute call-to-prayer every Friday, moderately-amplified from the bell tower in agreement with the Chapel staff and student Religious Life. Duration, content and volume were taken into consideration. “The Muslim call to prayer is a melodious chant that will be appreciated by anyone, regardless of faith, who has an ear for spiritual songs,” said Princeton University Imam & Muslim Life Program Coordinator Sohaib Sultan. The adhan is an invitation to those who believe, not worship or public prayer itself. In addition, Allah is the God of Abraham of of the prophets Moses, Jesus/Isa, Ezekiel and Mohamed. Following the call, the Muslim students would continue to meet in the Chapel basement. Duke’s Muslim Student Association Preparing for Eid. Thousands of Americans did not like this, were outraged even. They took to the media and social media with an ignorant and hated outcry. This even reached the Facebook page I administer for Egyptian students interested in studying in the United States. Because I have been abroad for 2.5 years here, I have been away from this sort of American chatter and suddenly felt sick upon reading it. Thousands of vile comments on many different sites, fueled by Franklin Graham. Students and staff who are U.S. veterans claimed that hearing the call-to-prayer would bring back memories of Iraq and Afghanistan and increase PTSD and veteran suicide. Hundred said there should be no Muslims (of any nationality) on U.S. campuses. Some suggested they build a mosque on campus to “keep the Muslims out of God’s house.” They also suggested the Muslim students just use chimes and watches. They spoke to the idea that the U.S. is a CHRISTIAN country, and that OUR children don’t have the right to pray in school and eat at Chick-Fil-A. They equated the call-to-prayer to a promotion of violence. If you want to peak inside the mouth of ignorant, intolerant America to see what I mean, look here. My heart broke reading that. The director of Duke’s Islamic Studies Center had this to say. I took to social media to face the monster of American ignorance and intolerance, if even just a bit. March is supposed to be Islamic Awareness Month for Duke University’s Muslim Student Association in coordination with the Islamic Studies Center. I support them and wish them success with the monster they face. They shouldn’t have to face it alone. Please consider signing the Duke student petition. “I Have Looked Into the Mouth of Ignorant, Intolerant America: A Duke Story” -Shawn Lent | go do.